We've become so consumed by who we think we "should" be and all the things we "should" do, that we've completely lost sight of who we really are. And let's face it, we figure that who we really are probably isn't good enough anyway, so we do whatever we can to ensure she never sees the light of day. And where has that got us? We're more stressed, unhealthy and unhappy than ever before. Well I've had enough, have you had enough? Debs certainly had, and that's how the book Unfaked was born. Unfaked is Debs' story...but it's also your story...because it's actually the same story for all of us. Debs bravely shares her innermost thoughts and feelings in real time, as she heads towards rock bottom and finds her way out again. And luckily for you, her insatiable need for detail and organisation means the book has become a bit of a guide for doing life - so you not only get to experience the specific strategies and tools she uses to break free from the busyness loop and find true health and happiness, you get to apply them too. 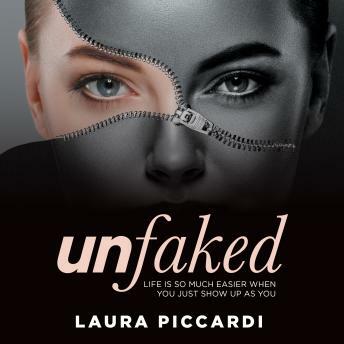 Unfaked is all about making life easier, while having a good time in the process. It cuts through the surface level crap, and gets right to the heart of the one thing that will give you ultimate control over your body and life - to be you, the real you and nothing but the real you.